Articles about "Archos G9-Android Tablet Dual Core Processor" in this website is free. Read our reviews for "Archos G9-Android Tablet Dual Core Processor", gadget price, specs, features and find more latest Electronic Gadget Reviews and News. Archos G9-Android Tablet with 1,5 GHz Dual Core Processor-Archos released the Android-based tablet computer with a processor that may be the most powerful at the moment. French technology vendors that include a 1.5 GHz dual core processor OMAP 4 (ARM Cortex A9). Archos G9 line also has a version that uses a Nvidia hard drive that has greatest capacity in the realm of tablet pc, which is 250GB. While the Android operating system is Honeycomb version 3.1. There are two options for G9 tablets, the Archos 80 G9 with 8-inch screen and Archos 101 G9 with 10 inch screen. Its features include Wi-Fi, GPS, USB ports and the ability to record High Definition video (HD). Unfortunately not yet known the size of RAM of this tablet. Fun, both of them would be sold at affordable price. 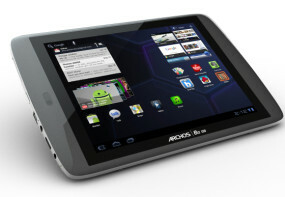 Archos G9 80 on sale from USD 279 and Archos 101 start from $ 349. Both tablet products are planned to be marketed starting September 2011 in several countries.